Cold Soup anyone? It’s time for something healthy and refreshing for these warm summer days. I’ve just purchased a Vitamix and I wanted to try out something that would test how smooth I could get a soup. If you haven’t heard of a Vitamix, then for those of you with young kids, it’s a bit like the Nutri-Bullet that you have all seen on the Shopping Channel or on TV3 at 6.30am. But this does so much more and with much more power. It blitzes the living be-jaysus out of anything and will even cook a soup for you in 5 mins. 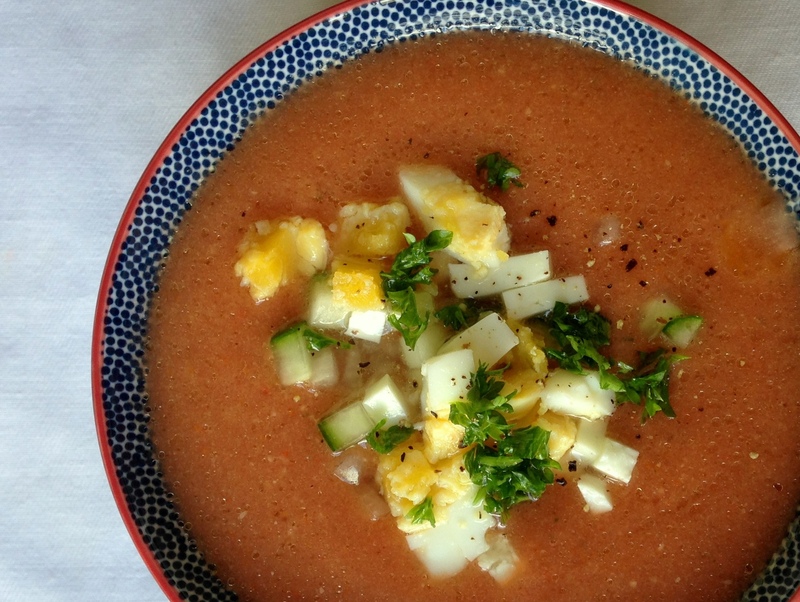 This version of gazpacho is very easy and is based on a version by Felicity Cloake in The Guardian. Soak the bread in cold water for 20 minutes, and then chop all of the ingredients and throw them all into a blender. Blitz it until it is smooth. Adjust the taste by adding extra sherry vinegar or salt as required. Chill until ready to serve. To serve, top with a drizzle of olive oil and some diced cucumber, hard-boiled egg, parsley or mint. For a more extravagant twist or if you are having a dinner party, why not add a shot or two of vodka to the mixture until you can just taste it.